High specification Audi A8 SE Executive with Satellite navigation, Reversing Camera, Full leather interior, Electric front memory seats, Heated front seats, Power opening/ closing tailgate and Bluetooth audio. One former owner with service history. 4x Recent Pirelli P Zero tyres. 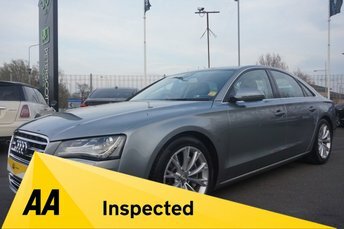 We have uploaded a full Hd walkaround video to show the quality both inside and out of this Audi A8. This Audi has been independently inspected by the AA for your added peace of mind. Comes with ,full clear Gold HPI Report, 128 point AA Inspection Report, AA History Check Report, 12 months AA Breakdown Cover. Please call or message if you require further information or to make an arrangement to view. Peter Scott Cars is an Award-winning family run dealership with over 30 years of experience in the sourcing and supply of quality pre-owned vehicles. Find yourself behind the wheel of a used Audi A8 and you'll quickly discover what makes this premium executive saloon stand apart from the crowd. Luxurious in every detail, the A8 is Audi's flagship model. Incredibly elegant, well equipped and outstanding to drive, it's a car that demands to be noticed. For a superb deal on a used Audi A8 for sale in Widnes make sure you come to Peter Scott Cars. We've been helping drivers to find their ideal pre-owned vehicles for years so why not let a member of our team speed up the search for your next car. View our latest stock online before getting in touch to arrange a test drive.